Queen Victoria sits to the side, shifted some years ago from her central spot gazing up to the city. She was moved to accommodate the arrival of a metallic cone, a “whale’s tusk”, emblazed with New Kirkgate on it, a fitting upgrade taking the foot of Leith Walk into the 21st century. Sadly, the whale’s tusk didn’t have the staying power of the old monarch and was widely criticised by locals. One intuitive older resident reflected beyond the aesthetics of the sculpture and questioned the labelling, “The New Kirkgate” she called, “as if we didnae ken”. She was right, the New Kirkgate and the Foot of the Walk are hardly a draw, with formidable pubs, cheap shops and Leith’s least fortunate souls huddling together to compare score sheets. It doesn’t get many visitors, no tourist has ever stopped me and asked for directions to the New Kirkgate. These areas symbolise Leith’s continuing problem – the vacuum and physical gaps created in a post industrial landscape and a series of failed regeneration plans. Yet Leithers are rightly proud of the area, it’s history, diversity, character (and characters!) – a balance of old and new. Preserving this balance is one reason that the Drum Property Group’s proposals to demolish a section of Leith Walk has generated so much concern. 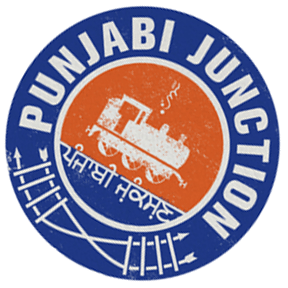 The development plans have become the talk of the steamie as locals raise objections to the demolition of a 1930s building containing much loved shops, cafes, the wonderful Leith Depot music venue and Punjabi Junction the successful Sikh social enterprise café. The proposed development contains six floors of purpose built student accommodation for 500 University of Edinburgh students, a hotel, retail units and just fifty “affordable homes” for Places for People. No one can confirm what “affordable” really means and how much these will cost. We do know there is a desperate shortage of affordable housing in Leith and across Edinburgh, where rents have risen year on year and rental accommodation is in short supply as the demand from tourists for short term rentals grows. Since the proposals were first discussed at the Leith Central Community Council where over seventy people turned up, “not to discuss the trams”, local residents and businesses have formed a strong, grassroots campaign group, Save Leith Walk. Locals have poured in to give support to the campaign which in just six weeks has seen hundreds of people attending meetings, over five thousand signatures against the demolition, raised almost £3,000 and has a series of fundraising gigs planned. Save Leith Walk have focused on five main objectives: to stop the demolition; to influence the design; to increase the amount of housing available ensuring it is truly affordable; to support the threatened businesses and to raise the profile of our vibrant and diverse community. Considering why the community response has been so overwhelming gives us an insight into some underlying issues. The City of Edinburgh Council’s economic growth strategy relies on tourism and anchor institutions such as universities. Visitor numbers have increased by 18% over five years. An increase in hotels, short term rentals and purpose built student accommodation are all products of this strategy. But this inevitably opens the door to big business moving into our communities. Purpose-built student housing makes big money for developers. 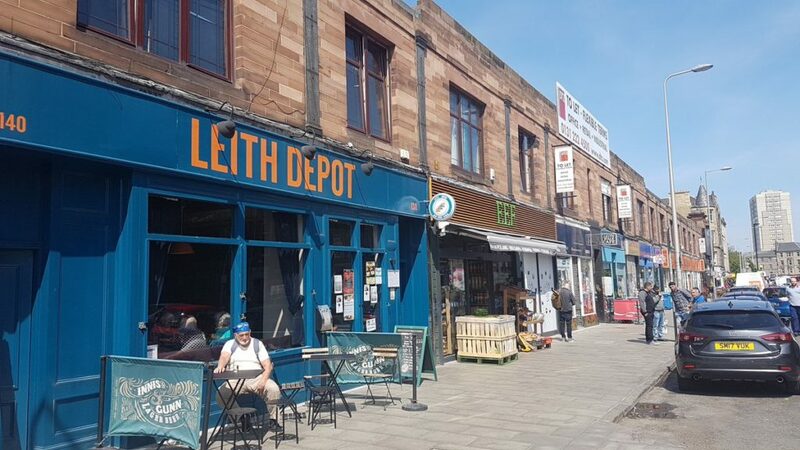 The two developments further up Leith Walk appear to have slipped by mostly unnoticed by many Leithers – but this one hasn’t – with some locals worrying it is Leith Walk’s last stand. We are keen to protect the very essence of Leith. We want a say in the decisions being made about how we live and work in Leith, the planned development will have a significant impact on the community, it’s businesses and buildings. Having a say in decision making was one of the key findings from Creative Leith’s Blueprint which reported on the lack of influence and sense of control felt by Leithers. The Save Leith Walk campaign recognise the challenges in planning for a growing city but believe that local communities must be listened to and their needs met. In a short time we have shown how communities can respond – we have seen the energy, creativity and capacity of Leith’s citizens coming together to raise their voices for Leith. We want to contribute to a vision for a modern Leith that retains the balance of old and new and ensures Leith can flourish and persevere. But it isn’t just Leithers suffering from a disconnect with local politicians, development plans and business decisions, it is echoed in campaign groups across Edinburgh and in cities and towns all over Scotland. Volunteer led campaign groups are trying to protect our heritage and sense of community, often up against planning processes that favour developers and council decisions to sell our land despite local protests. A lack of trust in politicians is compounded by a sense that local democracy is failing us. Something needs to change, and there are no shortage of ideas. Who makes the decisions, the type of economy we need and how we achieve change are issues that need addressed across Scotland. Local authority areas are too large, decisions are made too far away. We need smaller, more localised, inclusive decision-making processes to produce a creative vision for our towns and cities, one that is sympathetic to the people that live and work here – to redress the balance of people and profit. Growth based economic models rely on investment for profit, entrench inequality and are not sustainable. New approaches including local wealth building to control the local economy to circulate and retain income or community economic development with a focus on wellbeing rather than profit must be considered as viable alternatives for our local economies. Community organising builds relationships and utilises networks in our communities to create change. Community cohesion and a sense of agency combine into a powerful force. The campaign to Save Leith Walk, and many others across the country, are testament to the spirit of community, place and purpose that can be ignited when communities decide to take action. 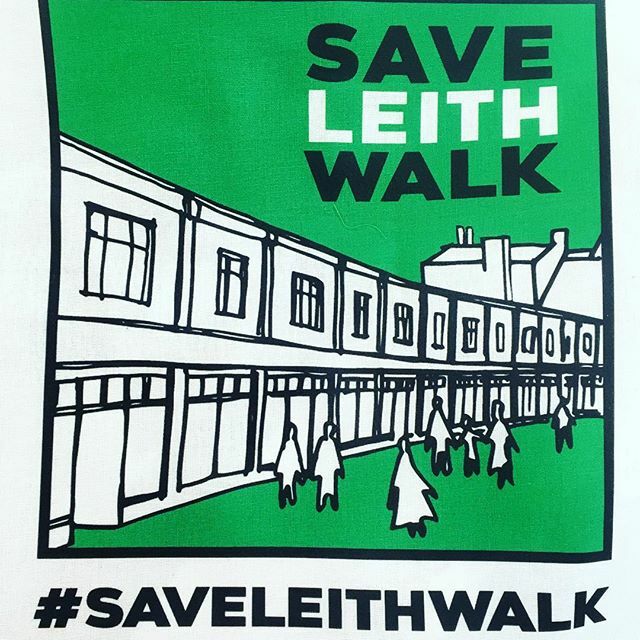 For more updates on the campaign follow them on Twitter @saveleithwalk here or on Facebook here. Well said. One of the most interesting campaigns taking place now, rasing fundamental issues about power and democracy and successfully engaging communities. just leave me bamboozled. Just what on earth does this mean ? It’s like you borrowed the phrase book of those you protest against. ‘Keep it in the family’, is what it means – not that hard to understand. If we think of money flowing around our community like water, it runs into homes and your bank account from wages, savings, benefits and other income payments. If our local shops, cafes and supermarkets are all corporates then the money flows into their tills and mostly “disappears” straight out of the area. Local Wealth Building just means creating an alternative for how we earn, spend and keep our money locally. There are more towns trying this approach across Europe. One example is the Bristol pound, where you can exchange cash for Bristol Pounds and spend them in local shops for the same value as the cash. The new planning bill is promising greater centralisation, unless it is amended. There is a proposal from the opposition to give communities some kind of right of appeal to level the playing field with developers, but the SNP has come out against this. It is a mistake to focus over-much on rights of appeal. Appeal rights can only provide communities with a tool to stop things happening. They won’t empower communities to create better places. Agreed. I can see some advantages to it, but also some drawbacks. But with a free go, developers are always likely to appeal – and with local authorities so reduced, they are less able to contest. It’s striking though that former supporters for a community right of appeal change their mind when they join the government. The planning bill proposes local place plans, but they don’t (at the moment) come very high in the hierarchy of things to be taken into consideration. Perhaps we just need to be bolder and remake the bits of Scotland that are in our control. If Leith returned to being its own local government then there might be a closer connection between place and people. The problem with a campaign to ‘Save Leith Walk’ is that, at present, much of it is not worth saving. The bottom end, in particular, as the article accepts is run down. That said, the thought of a huge block of student flats is depressing. As well as the two blocks further up Leith Walk, there is another at the top of Easter Road and yet another a few hundred yards away at Abbeyhill. What is there for the working class of Leith and Edinburgh in these developments ? Low wage jobs as cleaners and catering staff. In this respect, Edinburgh seems to be copying the worst aspects of the way London has developed in recent decades. A large, economically prosperous group – here composed of tourists and students – being catered for by local people in poorly paid jobs. I agree with that – many of those currently around leith are only interested in the working class when they are deploying their vernacular to give their own initiatives a bit of street cred. There is a self declared ‘creative class’ around leith that see the development going on and want in on it. This is essentially drums mistake – that they didn’t run a couple of yoga classes or pay off the usual suspects to run a workshop or two. What we have now is a campaign to ‘save leith walk’ which is essentially one which wants a deal for a music venue and some investment in a project for a bridge over leith walk. From the very beginning the campaign has been run by architects who want their bridge proposal included – there is little conversation about the needs of working class people in the area. Does the Community Empowerment Act 2015 offer ways forward? There are four pilot schemes in Glasgow wards which have just been announced. Why are they building student flats in Leith? The new town is closer to the university, demolish part of that instead. The flats are for Uni of Edin post grad students. Council policy on student housing is to ensure they have access to public transport links, don’t need to be next to education institution. The council is run by SNP and Labour in a no overall control situation so how can these parties allow this to happen?